After spending way more hours on this than I expected, the top of My Small World is now finished. I really feel that I've sewn every piece of this quilt at least twice. It certainly was a challenging quilt to make, and I wouldn't recommend it for beginners. However, I'm really pleased with how my top has turned out, and the effort all seems worth it now. I tried to use more of the types of fabrics Jen Kingwell used in the original version, but I just kept choosing bright fabrics over the more muted fabrics. The process taught me even more about myself and my love of all things bright. 3. read all the tips and hints posted during the Quilt a Long by Kerry at Very Kerry Berry blog. Of course you don't have to do everything they recommend, but it's always useful to know what others have done. If you're struggling with Part 5, you're not alone. I fiddled around with the rainbow and sunburst for about a week. I used English Paper Piecing, but I then had trouble getting them to sit straight on the quilt. Anyway, they are on now and I won't dwell on the days of fluffing around it took. I love all that green in the farm scene. If you want to see more close ups you can see my previous post here. I'm going to hand quilt it myself with Perle 8 and Aurifil 12wt because I want to accentuate certain aspects of this quilt (and because I need a bit of hand quilting practice before I start on my la passacaglia). For those who asked - Yes, I did show my la passacaglia quilt to Kaffe and Brandon. They said very nice things about it, and noticed all the Kaffe Fassett Collective fabrics in it. They mainly commented the use of colour and pattern, but also asked about the English Paper Piecing. Here's very grainy photo of Brandon Malby looking at it. Thank you Sue for the photo. Also - I've received quite a few comments from no reply bloggers lately. If I haven't replied to you, it will be because you're a no reply blogger. I suggest you google how to fix that, or include you email address in the text of you comment so I can get back to you if you're asking a question. Thanks. wow there is a lot of work in the wall quilt Wendy. But at least now you can say you've been there / down that and it looks fabulous. 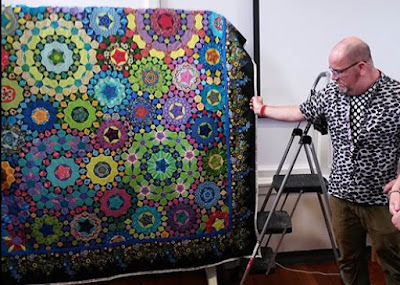 I didn't realize that small quilt had so much work in it - great job - I have seen a couple of these but not a lot. What a collection of perle cotton you have, I need to gather some up. Just wanted to give you a heads up about hand quilting this project - becausevof all the tiny blocks you are often going through lots of layers at lots of seams. I hand quilt most things and this one is a bear. Also - its easy to draw up your own paper pieces on grapg paper since you have all measurements - just in case people cant get them from Sew what sherlock or have trouble printing at the right scale. Your piece is just lovely! Where are you going to hang it? Love the quilt! It's so cheerful and full of so many wonderful things to look at. You are going to enjoy hand quilting all this happiness. Love the colours you have used in your "Small World" quilt and you have an amazing stash of perle. Congratulations on a fabulous finish Wendy! Your piecing looks so crisp and clean! And I really love the blue of your sky! I wish I had thought to do that! I have everything apart from the foundation paper piecing patterns to start ... I'm having s wobble about starting it now that I know you struggled with some sections - eek! But every time I see one finished it just makes me want to have one all if my own ... so here goes nothing! Wow well done! Jenny at jenny's threads showed hers yesterday and i commented that i saw tons of bloggers start this months ago but hadn't since anything since. Good on you for proving me wrong! Just Fabulous! I love everything about it and it will be even more fabulous after you add the hand stitches. What a great quilt. Love yout quilt Wendy, thanks for the hints, nice to know it has been released as a stand alone patter, glad I got the magazine copy! beautiful result Wendy. I can see that it was quite a challenge - even for you. I would certainly think hard before having a go myself lol. I am very tempted by the Christmas Tree on the front of the latest Simply Moderne though! 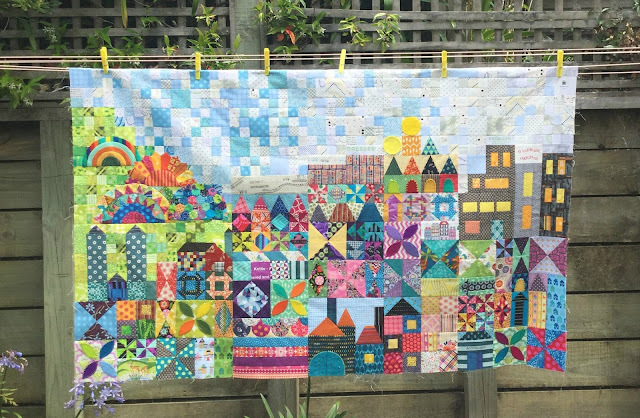 Your Small World quilt has come together really well with your fabric and Colour choices. Enjoy your hand quilting. Your fabric choices are lovely. Congratulations on a wonderful finish. It is so much more detailed than what you see at first, so many kinds of techniques. You persevered and have a piece that is so uniquely yours in the colors and liveliness. Enjoy it! Hi Wendy, your small world quilt looks wonderful. I did mine with very bright colors as well. I just love how happy it makes me when I look at it. I quilted mine with cream colored perle cotton on the whole thing. Yes, the quilting is a bit fiddly with all the seam lines, but persevere because it really does look great when done. This would be such a fun project to stare at for ages. I notice something each time - like the clever use of the rainbow stripe fabric for the rainbow. Love your small world. Thanks for showing it as I would like to make it. This is stupendous! I have only sections 1 and 2 finished, and it's in the queue after I get back from traveling. I love how your sky moves colors--I may have to "borrow" that one too. You are a quilter after my own heart in so many ways, and I love that I can look to you for inspiration. Thank you!! Fantastic Wendy - I love the vibrancy of your colour palette!